How the EU got to where it is and what can be done about it. Chapter 8 of Blimey, it could be Brexit! 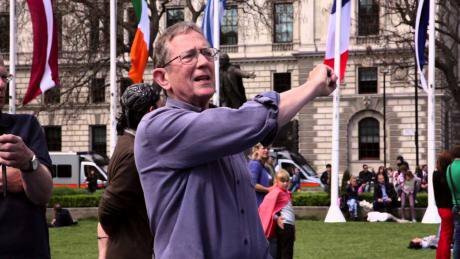 Anthony Barnett, speaking at Occupy Democracy, letmelooktvI don’t know about you, but I am in bad company – the company of everybody else. I have scorned Britain’s self-described “Eurosceptic” prime minister and his Remain camp for being self-contradictory. He claims his deal delivers an unbelievable “best of both worlds” when by solemn treaty it means the UK commits itself to “facilitate” an ever-closer political union that he abhors. I have scorned the self-described “liberal-cosmopolitan” ex-mayor of London and the cohorts for Leave, as being self-contradictory for heralding an unbelievable economic renaissance to be brought about by independence from the EU thanks to returning democracy to Britain, meaning elective dictatorship. In a coming chapter I will scorn the leader of the Labour party for being self-contradictory if he wants to install the most left-wing government ever in the UK (which I applaud) while saying sweet Fanny Adam about the democratic challenge the EU presents (that the Leave campaigners are so right to pose), for to be left-wing and not constitutionally democratic is not to be left-wing at all. For this week’s example of being self-contradictory see Paul Mason’s scorching assault on the EU as the authoritarian host of “rentier monopoly corporations, tax-dodging elites and organised crime”, which we must nonetheless remain in to “bide our time”. And now for mine. Hopefully it is only a mote and not a beam in my own eye but I support DiEM 25, the Democracy in Europe Movement, with its call to “Democratise Europe, or it will disintegrate!” I think this makes sense, as a way needs to be found for the EU to become a democratic process for Europeans or it can’t survive. But it must seem contradictory to call for membership of something that has to be dismantled if not overthrown! Just like everyone else, in this strange referendum, I am arguing against myself while trying to appear completely convinced of the coherence of my position. Why this set of tensions? The answer lies in the EU. I’m a war-baby, I first hollered in the months that German and Soviet armies battled through the winter for Stalingrad, to determine the European outcome of the second world war. In my lifetime the European Union is the most successful, progressive project of political transformation and human improvement bar none. Yet today it is an engine of division and reaction. The sequence that led it from its incredible benefits to its current disastrous influence is buried in the genome of its conception. But so too is the energy and life-force that has helped lift a continent from a nightmare of war, genocide and destruction to freedom, wealth and collaboration. To be for it, is to be against it. While the most interesting of the Brexiteers, Boris Johnson, is against it to be for it. The double-falsehood is no place to start a debate on the future of Britain and Europe. I want to rub this point home. For in one fundamental way I am not in the company of almost everybody else. I am part of the band who does not believe that whether or not we should be in the EU is a matter of calculation, profit or instrumentally computed advantage. The decision to have a plebiscite on whether the UK should Remain or Leave the EU has been called by a prime minister who did not want to have it, does not believe in the process, and will – as I have shown – say anything his spin doctors tell him or his teleprompt puts in front of his eyes. The result of this unprincipled exercise is a debate dominated by arguments over financial gains and losses with both sides greedy for profit at the expense of the EU. Give us our money back, say the outers. Give us “the best of both worlds”, say the inners. What a crapulent, humiliating way of talking about what kind of country Britain is. The latest example is the shocking official Remain flyer that has just dropped through my front door, promoted by Will Straw. The front has six quotes, every single one is about money. The back it has five curt arguments concerning: jobs, finances, businesses, prices and public service cuts. Not a word about our democracy or liberty. It’s a serf’s charter, proclaiming everyone will be even more screwed if we leave than we are already. The prime minister declared the referendum to be about what kind of country we are. Well, now we know what kind of country he thinks we are. There is a story about the once famous playwright George Bernard Shaw talking with society debutants in the early twentieth century. Would you share the night with me, he asked, if I make sure you get a million pounds. They laughed with pleasure and delight. Would you sleep with me for £5 he continued. Shocked they said, “Who do you think we are?”. I already know, he replied, “we are haggling about the price.” Would you want to share your country, let alone the night, with those who talk the way our leaders do? Would you want to be a member a Union justified by haggling? Nor are Labour Remain argument's immune from this approach. Labour is the party of the screwed not the party of the screwers, so it is less cynical. But when it supports remaining in the EU because it has extended workers rights, it too treats the EU as just a means to an end. Europe does not just issue a torrent of regulations, laws, treaties, judgements and proceedings there are also scenarios, pamphlets, studies, and theories, realist, neo-functionalist and so on, that are mind-numbing not because they are necessarily badly written but thanks to the airlessness of it all. An outstanding exception is Hans Magnus Enzensberger’s Brussels, the gentle Monster. A slim 80 pages by the wonderful German poet and essayist published in 2011, he went to the buildings with a thousand windows to see what went on within. Dry and understated, it is impossible to read without shaking with laughter. On all those words, the poet observes that by 2005 the accumulated laws and regulations of the Union “which no soul has ever read” came to over 85,000 pages weighing “as much as a young rhinoceros”. Five years later and they weighed as much as two young rhinoceros. EUR-lex, the database of all legal orders, records, ran to a grand 1,400,000 documents. This may be unfair as it includes multiple translations. From what I can make out the EU is generating 10,000 and 20,000 documents a year since 2010. Inspired by Enzensberger’s example without hoping to emulate his poetic brevity and touch, I want to try and understand what the European Union is, knowing that it is a changing and growing process. It can't be reduced to a single, teleological project whose only objective is the creation a super-state. Nor is it just a parliament for our continent. It is not a simple ‘thing’ like a bus or train. So what is it that the British voters must now decide whether to remain in, or to leave? The answer demands a necessarily difficult analysis, not least because British policy has been bound up in the EU’s current development. To try and answer it I’m going to set out some of the stages of my efforts to comprehend the EU on my journey to DiEM25. The European Economic Community or EEC (also known as The Common Market) of the six original countries, France, Germany, Italy, Holland, Belgium and Luxembourg, came into existence with the Treaty of Rome in 1957. It is now the European Union. I will keep to its current name throughout. As with many Brits at that time it was for me a background noise of failed attempts to join it, conducted by humiliatingly incapable governments Conservative and Labour, until Edward Heath became premier in 1970 and negotiated entry in 1972. This was the founding moment of the Brexit debate. Then as now it was fought within and between the Tories, with Enoch Powell combining the figures of Farage, Gove and Johnson in his singular character. (He aroused a hatred of immigrants that outruns Farage, spoke with the precise intellectualism of Gove, wrote better Latin than Johnson and harboured an ambition that matched them all). But there were differences. Most important, Heath was wholeheartedly in favour of Europe, making it a clash of principle. Second, there was no referendum. Instead there was a ‘great debate’, including a six-day one in the Commons (it is very revealing that, as I pointed out in the introduction, the Commons has not debated the deal negotiated by the prime minister at all, merely been allowed to ask him some questions when he presented it to the house). I voted ‘Yes’ to Europe in the referendum of 1975. To which I could only say, “Really?”. Followed by, "This is unbelievable." Followed by something a great deal less polite. Something shady was taking place. Citizenship needs to be fought for, argued over and above all claimed. Now “every person” of the member states was re-branded without a by-your-leave. There can be moments in relationships when the person you love does something and part of you goes ‘uh oh’ and you try not to think about what it foretells. Only afterwards do you look back and realize that a ruinous flaw was revealed. I was campaigning flat out for citizenship in Britain. Suddenly, without any forewarning, my – no, our - European citizenship had been bestowed upon us like a sentence, through a secret process that I could do nothing but abhor. Here was this wonderful, transforming organisation that I admired and respected, even if I did not love it. And it had acted with complete distrust of its own people. When I stopped running Charter 88 in the mid-nineties I tried to think through the implications in terms of the combination of nationalism, democracy, capitalist globalisation and constitutional progress that marked the century’s last decade. Two arguments stood out from the dross with respect to the EU. Alan Milward’s great book, The European Rescue of the Nation State showed me how, country by country, the European Union grew out of the need for a profound post-war reconstruction, including full employment, welfare and education, across all the belligerents. The shared framework of the EU did not dissolve their socio-economic development into a single entity but rather provided the pattern for their collaboration as non-belligerent societies. This, then, renewed them as nations and did not dissolve them into a single entity. It gives the EU a quite different feel if you see it as enhancing its member nations as nations, rather than undermining them. The second was a forensic analysis of the inner capacity of the EU, in generous review of Milward by Perry Anderson (reprinted in his The New Old World). He identifies the political process that created the European Union whose chief architect was Jean Monnet. Anderson quotes Monnet as saying, “We are starting a process of continuous reform that can shape tomorrow’s world more lastingly than the principles of revolution” and he describes this as “incremental totalization”. Monnet’s strategy is an alternative to Leninism. It sets itself an unparalleled, ambitious objective “a democratic supra-national federation”. It then goes about achieving this “enterprise of unrivalled scope” through “drab institutional steps” that relied on “narrow social supports”. There is a profound revulsion in the British Conservative party to the EU and its entire works shared by both those wishing to Remain and those for Leave. This is because all Tories desire to minimise change to our political structures – their core project is to conserve. But the whole point of the EU is to move things on, to build new institutions and define anew how power operates and to share sovereignty. 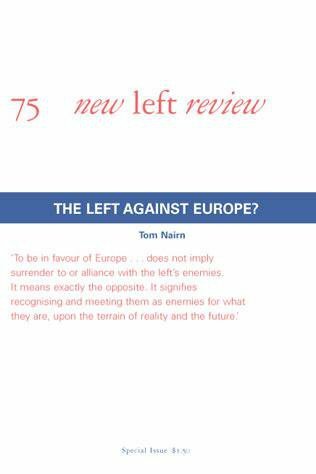 This does not necessarily mean the replacement of the nation state by a Euro-super-state but it must mean, indeed it is meant to mean, the practical, moral and psychological ending of Europe's antagonistic old regimes – of which both Hitler’s empire and Britain’s were examples. All Tories are agreed they cannot participate in this 'unBritish' project. Given the EU’s size and influence and role in supporting corporate power, one wing of the Conservative party wishes to exploit it. In Cameron’s language, to retain a “special, best of both worlds” relationship so as to to lever the UK's influence in global affairs. The other wing fears that such blatant corporate sycophancy risks the loss of traditional loyalty and prefers a different wager: to rely on British skills as a global Singapore. Both wings abhor the Monnet project of shared change and want no part in it. One day an English left will be born that can grasp the opportunity that the European process offers. But can there be such a thing as a “democratic supra-national federation”? As so many are slagging off the EU at the moment it is important to salute its democratising achievements. These were not just to create a zone of peace where there had been war, genocide, firestorm bombing of civilians (especially by the allies) and forced labour on a catastrophic scale after 1945. The EU reversed fascism in Spain, Portugal and Greece in the 1970s, supported the democratisation of Eastern Europe in the 1990s, and raised human rights standards everywhere. To give an example, rarely acknowledged in self-satisfied world of Westminster and the London media, the Northern Ireland peace settlement is a product of the Europeanization of Ireland as a whole including, however grudgingly, the Catholic and especially the Protestant communities in the North and the UK itself. (This myopia continues in the Brexit debate, with neither the official Leave nor Remain camp being able to acknowledge the intrinsic value of the European Union to British democracy in this part of the United Kingdom). The central issue, which demands a much fuller treatment than I can give it here, is the nature of nationalism in a multi-national and now digital world. Politically, the cardinal issue for the European Union is the relationship between nationalism and democracy. For some in the Brussels elite, the ‘mere’ nationalism of 'mere' nation states is something that their long-term aim is to marginalise, as a feudal hangover. They have set themselves against the democracy of ‘narrow’ nationalism, as they see it, and seek to replace it with public support for a united Europe ‘fit’ for global competition. In effect such members of the Eure-elite are wedded to up-scaling an old regime mentality. British Tories should not alone in opposing this, indeed it is essential that such opposition is not confined to right-wing, populist nationalism. "They do say that a few lunatics once in a while make democracy a worthwhile experience. Thanks, for the reminder that the Achtung! Schtrumpf! Heil Hitler! crap of B-movie fame has not altogether disappeared from the public debate. More seriously, Reinhard argued, “But something is not happening. We are Europeans on the ground. We are Europeans in our stomachs, as a succession of food crises has shown, but we are not Europeans in our heads”. His last article for openDemocracy, Crossroads or Roundabouts, where now for Europe, written in June 2004, just before his fatal illness was diagnosed, wrestles with this theme but under much greater stress, in the shadow of terrorism and the Iraq war. Consistently, he battled and scorned abstract Euroscelorotic language. He welcomed the British government’s recent announcement that it would put any proposed European constitution to a referendum, because for him Europe needed the peoples’ support. Four months later I had the baleful task of speaking about Reinhard at the memorial meeting for him in Berlin, in front of the Chancellor. Losing, our key European advisor was a great blow to openDemocracy especially as a larger strategic setback was sinking in. At the start of the century when we were planning its launch I assumed that there was nascent European public interest in debating the continent’s democratic future, ready to take advantage of the new medium of the web. Not a ‘demos’ but enough people like Reinhard, democrats committed to the EU and wanting a public forum, to create a self-aware ‘continental’ readership. This was not to be. Even at a relatively elite level of those interested in current affairs the existence of a web platform did not overcome what James Curran calls “nationalist and localist cultures” in his Why Did the Internet Change So Little? It is well and good to call for the EU to be more democratic. But if hardly anyone wants to be a democratic European it cuts no ice. There is only one alternative to spontaneous, organic demand from below in response to the new situation, namely the conscious creation and orchestration of such demand by dedicated advocates through persuasion and example. This needs funding and support necessarily independent of the EU institutions themselves. Apart from the outstanding efforts of George Soros’s Open Society Institute and Foundation, whose contribution to defending the civilisation of the continent is without parallel (and whose Institute and Foundation support the work of openDemocracy), there were few organisations willing to act. There are many wealthy ones committed to worthy public ends, such as those affiliated to the European Foundation Centre with its programme of supporting democracy and debate. But as multilingual European journals and websites designed for the intelligent public and in need of only modest support have closed this century it is clear a significant abstention is at work, which has contributed to the present democratic vacuity of the EU process. Perhaps the best way of to see this is by comparison with the nascent bourgeoisie that initiated movements for national self-determination in 19th century Europe and recruited the public into them, whether through trade unions or churches, or warfare. Today, there is no nascent Eurogeoisie seeking the dangerous support of the unwashed or even unwashed journalists to help further its influence. Early capitalist liberalism was up against absolutist monarchs and had feudal restrictions to overcome. It needed to enlist if not ‘the masses’ certainly the skilled professional classes into becoming a patriotic public. This in turn needed a media. By contrast today’s Eurogeoisie has no need for popular consent, indeed the less of it the better. They are already in charge! Despite their fine sentiments real, actual democracy is seen as a potential ‘anti-European’ enemy, a threat to the larger project, that is to say their own monopoly of it. It was precisely the frankness, the wit, the caustic realism, a writer’s sense of how things looked from below, which Reinhard’s skills exemplified, that they did not want! When it was needed most, the seed bed of European democracy was left to wither. “I entered the process with enthusiasm… But I confess, after 16 months at the heart of the process, I am concerned about many aspects of the constitution… The most frequently cited justifications for a written constitution for Europe have been the need to make the treaties more understandable to European voters and the need to streamline the decision-making procedures of the European Union after enlargement. I support both of these aims. But the draft document in four parts and 335 pages in the official version, is hardly the handy accessible document to be carried around in a coat pocket which some had hoped for at the outset. From my experience at the convention it is clear that the real reason for the constitution – and its main impact – is the political deepening of the union. This objective was brought home to me when I was told on numerous occasions: "You and the British may not accept this yet, but you will in a few years' time." The convention [has] brought together a self-selected group of the European political elite, many of whom have their eyes on a career at a European level, which is dependent on more and more integration and who see national governments and national parliaments as an obstacle. Not once in the 16 months I spent on the convention did representatives question whether deeper integration is what the people of Europe want, whether it serves their best interests or whether it provides the best basis for a sustainable structure for an expanding union. The debates focused solely on where we could do more at European Union level. None of the existing policies were questioned… This Treaty establishing a constitution… will be difficult to amend and will be subject to interpretation by the European court of justice. And if it remains in its current form, the new constitution will be able to create powers for itself. It cannot be viewed piecemeal... we have to look at the underlying spirit. The British decision forced the hand of President Chirac in France. Every household in France was sent their own copy of the final constitutional document. Shortly after the UK returned Blair as prime minister in early May 2005 (on a record low of 35% of the vote), the French rejected the proposed EU Constitution by 55% to 45% on a turnout of 69%; three days later, the Dutch were even more decisive and gave the constitution a thumbs down of 61% to 39%. Already alarmed that they would be humiliated in any referendum, a relieved Jack Straw phoned Blair to tell him the early news of the French result: there would be no need for the UK to consult its voters now the French had rendered the proposed constitution otiose. “What a tart”, Blair commented, when he put down the phone. (An apt one word description of the whole Blair gang). The French and Dutch votes were the moment of truth for the European project. For the first time a full Treaty that was being proposed was put to people, to its own designated ‘citizens’ indeed, in their respective countries to decide. The Spanish voted enthusiastically in favour. Then the twin rejection followed in two of the original six. Obviously, a profound re-think in Brussels was called for. It had to rise to the challenge to create the public debate essential to winning support for the integration it envisaged. There you have it, the judgment of the people is reduced to an infection, with even less life in it than vermin. Referendums are a virus. Lisbon made the EU an independent legal entity, which it had not been before. It created a diplomatic apparatus in parallel to those of the EU’s nation states. It charged the European Court in Luxembourg with the power to impose its judgments on all member governments. Whether this is ‘really’ a constitution is sophistry. Whatever it is, it demanded the positive assent of the EU population, based on a coherent understanding of what it proposed. Faced with the Dutch and French rejections the apparatchiks of the EU should have accepted the peoples’ verdict and stood the process down until they had gained such consent. Instead, urged on by Blair, the EU abandoned democracy in favour of a capacity to project its power. Lisbon replaced all previous existing treaties, from Rome to Maastricht. Today, it is now the Treaty of the EU. With the decision to defy the peoples’ verdict built into it, the European Union has become a flagrantly undemocratic oligarchy. There is a direct line of descent from Lisbon to the German finance minister telling his counterparts in the European Union last year, “elections cannot be allowed to change an economic programme of a member state”. In effect, the EU betrayed itself. So profoundly, it cannot survive in its present form. It was one thing, mistaken perhaps but honourable, to foresee the replacement of national nationalisms with a European patriotism, larger, more expansive, implicitly more civilised, in the long-term prospectus of Europe’s “ever closer union”. This vision of a 'super-state' foresaw a European democracy, a power that won the active assent of the peoples of the continent, indeed without such energy and loyalty it cannot succeed if the idea is to compete with global powers such as the USA and China. This option has been foreclosed for the existing EU thanks to the way its institutions have been set up by Lisbon. A form of rule created in plain defiance of the popular will is not going to be able to recruit it, at least not without undergoing a deep transformation. If Brussels is a caterpillar intending to turn into a democratic butterfly the process of cocooning itself is going to be very painful indeed. Some of its recruits can dream about it, though. I experienced one such idealisation when, while the process of moving towards Lisbon was underway, Margot Wallström, the EU’s Vice President for Institutional Relations and Communication Strategy, launched Plan D for Democracy, Dialogue and Debate. It was about “Making your voice heard”. For me it came to demonstrate the futility of worthy calls for more democracy. Six “citizen dialogue” projects were created. The King Baudouin Foundation funded a massive exercise in participative democracy. This recruited a random selected, representative sample of Europeans to participate in a reflection on what the European Union should become – making their voices heard. James Fishkin, who had developed the methodology, and whom I knew from my proposal to turn the House of Lords into a chamber selected by lot, was one of those recruited to design the whole exercise. Tony Curzon Price was openDemocracy’s editor-in-chief and with his generous interest in innovation he oversaw a big effort to cover the whole process, with Jessica Reed, J Clive Matthews and many others. I went to watch one of the sessions in Brussels. A hall of citizens from across the continent sat in small groups, each around a table, supported by phalanxes of simultaneous translators. For the first time I felt that Europe actually was in Brussels. But what came of it? A massive and doubtless still fascinating ‘dLiberation Blog’ on openDemocracy along with a shorter Citizens consultation blog and thousands more well intentioned words elsewhere. But not a dent on the EU itself, no particular advance towards democracy of any kind thanks to all the effort and expenditure, nor any measurable increase in wider public support. The exercised demonstrated a crucial fact about all attempts to make the EU as it now is more democratic. It is pointless to try and add more democracy to Europe’s lack of democracy. The ‘idea of Europe’ sucked in energy like a black hole with results ordained to be invisible. What to do about an EU that has turned from a system of solidarity to one generating division and chauvinism as its dream-factories crumble? In 2012 I was asked by Neil Belton and Fintan O’Toole to contribute a chapter on Europe to the collection Faber were publishing, Up the Republic! I wrestled with the material for two months but could not resolve my own view. I found it intolerable for Europe to continue as it is doing but equally intolerable to be against Europe. I had experienced the fruitlessness of efforts at adding ‘more democracy’ to it and could not advocate that kind of reform. But a return to nation states outside its framework was asking for reaction not republican self-government. I abandoned the effort, unable to resolve what a ‘republican’ approach should be for the EU. “a sense of foreboding, and a sense of concern, about what effect the crushing of the Greek government would have on them, their societies… on the capacities of their communities to make decisions pertinent to their own life…. soon I had this idea and scenario in mind: as Europeans we [must] harness the feeling that truly binds us together and allows us to redefine European identity on the basis of resistance… We can harness that spirit of concern for locality alongside the concern for the globality of Europe in order to create an alternative. We can stay in Europe in order to challenge head-on the highly anti-democratic processes and institutions of the European Union, and we can salvage Europe and the European Union from it. “From an economic viewpoint, the EU began life as a cartel of heavy industry (later co-opting farm owners) determined to fix prices and to re-distribute oligopoly profits through its Brussels bureaucracy. The emergent cartel, and its Brussels-based administrators, feared the demos and despised the idea of government-by-the-people. “Patiently and methodically, a process of de-politicising decision-making was put in place, the result being a draining but relentless drive toward taking-the-demos-out-of-democracy and cloaking all policy-making in a pervasive pseudo-technocratic fatalism. National politicians were rewarded handsomely for their acquiescence to turning the Commission, the Council, the Ecofin, the Eurogroup and the ECB, into politics-free zones. Anyone opposing this process of de-politicisation was labelled ‘un-European’ and treated as a jarring dissonance. The result, “is to prevent Europeans from exercising democratic control over their money, finance, working conditions and environment”. The DiEM Manifesto adds, “the price of this deceit is not merely the end of democracy but also poor economic policies.” It is an increasingly familiar argument, that neo-liberalism or market fundamentalism is stealing the language of democracy to create a disenchantment with politics, as in Wendy Brown’s description of it as a “stealth revolution”. But in the DiEM manifesto this critique has ceased to be an academic analysis. For it emerges from the experience of the cauldron itself. Thanks to Greek defiance we have witnessed the brutal imposition of the ‘technical’ on the democratic. Behind the stealth we have seen the steel; as the confrontation exposed the policies and interests behind the financial mask of neutrality. Which means in turn that the manifestos call for making the processes democratic is also a call for honesty that could become popular. The Monnet method of incremental progress towards an extraordinarily ambitious goal of European unification turns out to have been driven by a cartel consciousness. When bringing down barriers it was experienced as opening up Europe despite its closed procedure, as it made everyone more European. When, after Maastricht, it began to erect a machinery of its own centralised government, it began to treat national objections just as a cartel would: as a virus to be patiently but clinically exterminated. The fundamental difference between the numerous worthy, Plan-D type calls for the EU to have "more democracy", such as a better parliament, and the approach of DiEM is that DiEM 25 demands that the core institutions of the EU be replaced with a democratic heart transplant. The demand is cultural as well as institutional: the veil of technical neutrality must be pulled aside on economic decision-making to reverse the EU’s depoliticisation of democracy. Thanks to its late-modern construction in the era of market fundamentalism, the EU perhaps more than any other civic entity, seeks to put questions of the economy and therefore of equality ‘beyond’ politics and democracy. It is this defining process that DiEM 25 defies and aims to dismantle. It is a call to confront the absence of democracy not a plea for democracy to be tacked onto the absence. What kind of organization is this DiEM25 with the audacity to harbour such thoughts, even if unofficially for mine have no particular standing? It was launched at the Volksbühne in Berlin on 9 February by Yanis Varoufakis and Srecko Horvat. It is greatly to their credit they propose an experimental process in which others will create it equally. Varoufakis had told Feher it will “evolve organically”. The launch saw a day of three intense, crowded sessions of discussion between activists from across Europe (the third of which was chaired by oD’s editor-in-chief Mary Fitzgerald). A packed evening rally followed. The discussions mixed concerns and confidence: in many countries, especially Austria and Eastern Europe, it is the right that holds “the streets”; the danger of populism with the likelihood of deflation caused alarm; immigration is generating misanthropy. Well-articulated descriptions of the decomposition of traditional organizations, social democratic and trade union, provided the backdrop. But along with the defeat in Greece there was the success of Barcelona. Its deputy mayor suggested a new International Brigade to assist it and called for more “rebel cities”. This took the argument on to the commons and the potential political economy of a shared, progressive Europe. Paradoxically, DiEM could gain more traction thanks to the bleak veracity of its vision than from any idealisation of what is possible. In Berlin, Madrid and now across France with the Nuit Debout, it draws on the unruly energy of a precariat and its ‘digital natives’ starting to experience themselves as a trans-European class. If DiEM can find and build an agency, to use a technical term, the as yet unknown form for organizing the surge may be found, drawing perhaps on the experience of the Sanders surge in the United States. The promise of DiEM25 lies in the puzzle as to its nature, sidestepping usual categories. What makes it potentially influential is that it is a platform rather than a traditional ‘cause’, a space fit for digital times – a platform with a focus of course, setting out to re-politicise policy-making, especially in their economic and financial spheres, to bring back financial and monetary strategy to the reach of democracy. Such an open cause can become a springboard for projects and experiments that combat the marketisation and de-democratisation of power while networking across the European zones. Labour's John McDonnell has just made the young generation the centre of his call for Remain, rightly so; the test being if his party can embrace their culture. For we will not achieve the democratisation of the EU by traditional 'party political' means for its structures are fully prepared to repulse them, as Varoufakis has argued. The democratisation of the EU is an extraordinarily ambitious goal. The only way of achieving it is to turn the ‘Monnet method’ against the monolith that Monnet’s project has become: to hold to the overarching ambition while creating small realities that shape the long-term outcomes that can achieve it, strengthened by the hope of a new generation. Also, we can be emboldened by the weakness of the EU. As long ago as 2012, Martin Wolf writing in the Financial Times concluded, "The principal economic force now keeping the system together is fear of a break-up". This is far from the strongest of foundations! It exposes both the role of the Euro and the way it is run to a potentially successful challenge. To return to the UK’s referendum from this perspective is to ask what is the next small step to take. If your concern is simply Britain then Boris and his band of Brexiteers have the better argument, indeed the only argument with any patriotic integrity and republican virtue (of course, the UK is likely to be poorer and they should not pretend otherwise). 'Republican' in the sense that Walter Bagehot, founder of the Economist and author of The English Constitution, asserted, when he showed that behind the decoration of monarchy the Kingdom is a better-governed republic than the United States. The Brexit camp cares about how we are governed, the nature of our democracy and they scorn the undemocratic nature of the EU. On these issues Cameron, Osborne and their fellow Remainers and collaborators like Andrew Marr are silent. They know they are selling the country to the global corporate forces, which are funding their campaign and coming out openly in support of it; this being no ‘conspiracy’. It applies to their corporate Labour bed-fellows too, whether Blair with his £2 million a year fee from Wall Street’s J.P Morgan, or Peter Mandelson, friend of Deripaska and company. Their alarm, which is evident in the exaggerated claims of disaster as to what will happen to the UK’s economy if the people vote Leave, is indeed for them a genuine worry about the end of the world – as they know it. Their concern is not so much with what might happen to Britain, the British people, the country’s security or ability to go to war. Instead, just look at the rise of inequality they and their corporate caste have overseen since 1997 and its crippling impacts and you can see the process they are defending. If there is a sense of panic in their warnings it is over losing their place in the cocktail parties of the international power elite – to which they genuinely see 'no alternative'.